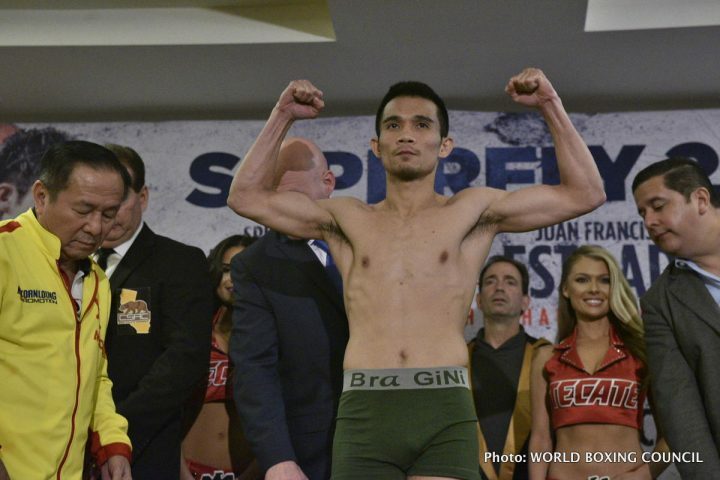 By Jim Dower: Srisaket Sor Rungvisai’s is getting a purse $250,000 purse for Saturday’s SuperFly2 card for his title defense against Juan Francisco Estrada on HBO Boxing at the Forum in Inglewood, California. Estrada’s purse is $100,000 for the fight. The 115 lb. weight class isn’t a popular one in the States. It was only until recently with the emergence of Roman ‘Chocolatito’ Gonzalez that the U.S boxing fans started taking notice of the super flyweight division. For the top fighters in the super flyweight division to start making the same money fighters do at 147, it’s going to take a lot marketing by HBO and the promoters. Gonzalez was on his way to becoming a star until Rungvisai beat him twice in 2017. Rungvisai is now in the position to take Gonzalez’s place if he can hold onto his WBC title for 2 to 4 years. HBO likes what they see in the 31-year-old Rungvisai. They’ll continue to televise his fights if he’s winning and looking good. Estrada might end Rungvisai’s 15 minutes of fame by handing him his fifth career loss on Saturday. Rungvisai (44-4-1, 40 KOs) will be earning very penny of his $250K purse in defending his WBC super flyweight title against former WBA, WBO flyweight champion Estrada (36-2, 25 KOs). The winner of this fight could improve their purses in the future if they can keep winning and impressing the U.S boxing fans that will be tuning in to watch the SuperFly card on HBO. The champions are unable to hold onto their titles for long at super flyweight. Former WBO super flyweight champion Naoya Inoue was a rare champion that held his title for a lengthy period in holding it down for 4 years, but his management were selective in the type of fighters they matched him against. Inoue never fought Roman Gonzalez, Carlos Cuadras or Rungvisai. Looking closely at the purses, one is struck by how little these fighters make for the amount of excitement they bring. These fighters are arguably more entertaining than most of the top welterweights, and yet they’re only getting a fraction of what the top fighters are making. It’s too bad 115 lb. weight class doesn’t get more attention from boxing fans. Carlo Cuadras (36-2-1, 27 KOs) battles McWilliams Arroyo (16-3, 14 KOs) for the vacant WBC super flyweight belt. This is the 29-year-old Cuadras’ big chance to get back to the top. He recently lost important fights to Roman Gonzalez and Juan Francisco Estrada. Those fights were ones that Cuadras could have won if he had just a little bit more in the gas tank. Cuadras gave Estrada and Gonzalez all they could handle in the first 5 to 6 rounds, but he couldn’t maintain the pace. Cuadras is now trying to improve his conditioning with trainer Abel Sanchez at Big Bear, California. It’s unlikely Cuadras will undergo a big remake of conditioning. At 29, it’s not reasonable to assume that significant changes can be made with a fighter that has been competing for 10 years as a pro. Cuadras will surely win on Saturday night against Arroyo, but it’s going to be hard for him to get past the winner of the Rungvisai-Estrada fight.